For over 20 years, Joes Quality Home Improvements has been providing a complete Home Repair and Remodeling Service. Our company started as, and remains a family run business focused on providing high quality home repairs and improvements to customers in South Eastern Michigan. We offer excellent customer service all at a price you wouldn’t believe possible! Our team is dedicated and experienced, and pride in our workmanship shows on every job whether it’s a small bathroom window replacement or a complete exterior painting. Whether you require a new roof on your entire apartment or condominium complex, we are the company capable of servicing your needs. You can count on Joe's Quality Home Improvements to handle whatever services you may need, small or large, with professionalism and quality workmanship. We even clean your gutters! One company to do it all! 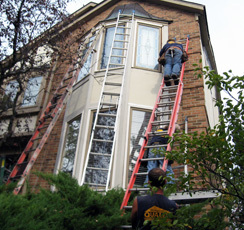 Joe's Quality Home Improvements takes pride in our home repair and maintenance services. When you choose us for your job you can rest assured that that your experience with us will be trouble free. We maintain an A+ rating with the Better Business Bureau and are fully licensed and insured. We have thousands of happy customers who have availed of our home improvements service over our more than 20 years in business.